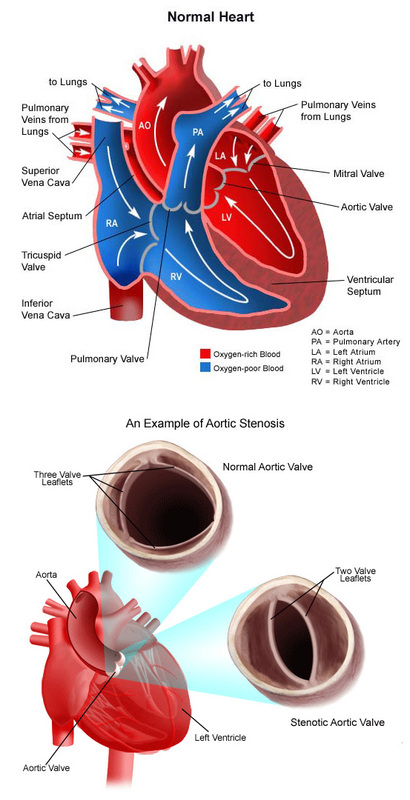 Aortic stenosis is a heart defect that may be congenital (present at birth) or acquired (develop later in life). If the problem is congenital, then something started to occur during the first 8 weeks of pregnancy to affect the development of the aortic valve. Congenital aortic stenosis occurs three times more often in boys than in girls. Only has two leaflets instead of three (bicuspid aortic valve). Has leaflets that are partially fused together. Has thick leaflets that do not open all the way. Becomes damaged by rheumatic fever or bacterial endocarditis. Area above or below the valve is narrowed (supravalvar or subvalvar). Aortic stenosis may be present in varying degrees, graded according to how much obstruction to blood flow is present. A child with severe aortic stenosis will be quite ill, with major symptoms noted early in life. A child with mild aortic stenosis may have few symptoms, or perhaps none until later in adulthood. The degree of obstruction can become worse with time. Congenital aortic stenosis occurs due to improper development of the aortic valve in the first 8 weeks of fetal growth. It can be caused by a number of factors, though most of the time, this heart defect occurs sporadically (by chance), with no apparent reason for its development. There is a higher than average chance that the aorta may become dilated (enlarged). This can increase the risk of an aneurysm or dissection of the aorta. The symptoms of aortic stenosis may resemble other medical conditions or heart problems. Always consult the child’s physician for a diagnosis. If a child’s physician hears a heart murmur during a physical examination, he or she will refer the child to a pediatric cardiologist for a diagnosis. A heart murmur is a noise caused by the turbulence of blood flowing through the obstruction from the left ventricle to the aorta. Symptoms your child exhibits will also help with the diagnosis. Chest X-ray. A diagnostic test that uses X-ray beams to produce images of internal tissues, bones and organs onto film. Learn more about chest X-rays. Exercise electrocardiogram (ECG or EKG). An exercise EKG is done to assess the heart’s response to stress or exercise. The EKG is monitored while your child is exercising on a treadmill or stationary bike. An EKG measures the electrical activity of your child’s heart. Learn more about exercise EKG. Cardiac MRI. A diagnostic procedure that uses a combination of large magnets, radiofrequencies and a computer to produce detailed images of the heart. Learn more about MRI. Some infants who are very sick require care in the cardiovascular intensive care unit or the neonatal intensive care unit prior to the repair procedure. Others who are exhibiting few symptoms will have the repair scheduled on a less urgent basis. Balloon dilation. A cardiac catheterization procedure in which a small, flexible tube (catheter) is inserted into a blood vessel in the groin, and guided to the inside of the heart. The tube has a deflated balloon in the tip. When the tube is placed in the narrowed valve, the balloon is inflated to stretch the area open. Valvotomy. A heart surgery procedure in which a surgical release is done to calcified tissue within the aortic valve leaflets that are preventing the valve leaflets from opening properly. Aortic valve replacement. The aortic valve is replaced with a new valve with a surgical procedure. Replacement valves fall into two categories: Tissue (biological) valves, which are made from animal tissues and valves that are soft and thin. Mechanical valves, which are made from carbon fibers, have solid valve leaflets. Children who have undergone a valve replacement will need to follow antibiotic prophylaxis throughout their lifetime. Patients who have received a mechanical valve will need life-long treatment with Coumadin (warfarin), a medication that thins the blood to prevent catastrophic clots from forming on the valve leaflets themselves. Aortic homograft. A section of aorta from a human donor with its aortic valve intact is used to replace the aortic valve and a section of the ascending aorta. This procedure is seldom performed due to the complexity of the operation and the rapid failure of the aortic homograft itself. Pulmonary autograft (Ross procedure). A section of the child’s own pulmonary artery with the pulmonary valve intact is used to replace the aortic valve and a section of the ascending aorta. A section of pulmonary artery from another human donor with its valve intact is used to replace the transferred pulmonary artery. What is the long-term outlook after aortic stenosis surgical repair? Most children who have had an aortic stenosis surgical repair will live healthy lives. Activity levels, appetite and growth should eventually return to normal. As the child grows, a valve that was ballooned may once again become narrowed. If this happens, a second balloon procedure or operation may be necessary to repair aortic stenosis. Sometimes the aortic tissue itself may be abnormal, which might lead to complications in the teen or adult years. Regular follow-up care at a specialized cardiac center should continue throughout life. Individuals who had a mechanical valve replacement may need to take anticoagulants (blood thinners) to prevent blood clots from forming on the artificial valve surfaces. It is extremely important that your child receives this medication on a regular basis and gets regular monitoring of the blood’s clotting status in order to maintain the most appropriate dose of anticoagulants. Because children grow so rapidly, medication doses change often. It is important to keep regular appointments with your child’s cardiologist to make sure your child receives safe and effective medication doses. Initial valve replacement is often performed using a tissue valve to avoid the need for anticoagulation, especially for females of childbearing age. Anticoagulation during pregnancy is very difficult to manage, and requires special treatment. Repeat valve replacement is not uncommon during a person’s lifespan, especially when replacement happens in a growing child. In addition, blood pressure should be closely monitored and managed. The cardiologists at the Heart Institute will discuss your child’s specific long-term outlook. Ventilator: A machine that helps your child breathe while he or she is under anesthesia during the operation. A small, plastic tube is guided into the windpipe and attached to the ventilator, which breathes for your child while he or she is too sleepy to breathe effectively on his or her own. Many children remain on the ventilator for a few hours to a few days after surgery so they can rest. Urinary catheter. A small, flexible tube that allows urine to drain out of the bladder and accurately measures how much urine the body makes. This can help determine how well the heart is functioning. After surgery, the heart may be a little weaker than it was before, and, therefore, the body may start to hold onto fluid, causing swelling and puffiness. Diuretics may be given to help the kidneys remove excess fluid from the body. Chest tube. A drainage tube may be inserted to keep the chest free of blood that would otherwise accumulate after the incision is closed. Bleeding may occur for several hours, or even several days after surgery. Other equipment, not mentioned here, may be used in the CVICU and will explained as needed. Following a procedure or surgery, children are kept as comfortable as possible with several different medications; some of which relieve pain and some of which relieve anxiety. Our staff, including our certified child life specialists, work with the family to find the best ways to soothe and comfort the child. As your child recovers, you will learn how to care for your child at home before your child is discharged. Your child may need to take medications for a while, and these will be explained to you. The staff will give you instructions regarding medications, activity limitations and follow-up appointments before your child is discharged. Your child’s cardiologist may recommend that antibiotics be given to prevent bacterial endocarditis after discharge from the hospital.